This is a guest post from Speech Architects. When someone clicks on your website or sales page, to convince them to keep reading, you have exactly as long as a cheetah takes to accelerate from 0 to 60 m.p.h. - an absurd three seconds flat. You won’t need sorcery or voodoo dolls to make that happen, but rather well-written, jargon-free words that talk about them first and foremost, instead of how great your product is. Great copy stops people in their thoughts, excites them, makes them to look forward to experiencing your product or services and, and as a bonus, oftentimes, price becomes a triviality, because they feel that you understand them and their needs. 1. Tell a story with your words. Make your reader feel something. Don’t simply serve them a product description, make them imagine their life with it. See this hat description from J. Peterman: “The Hat, the Attitude, and You. The hat that conquered the Australian outback. Practical when waltzing Matilda across deserts and through forests, dashing in Melbourne, too. Has a movie-star aura but will last longer. Don’t you want to take this description on a romantic getaway to Bali and launch sky lanterns into the night sky? What sets this piece of copy apart is that it paints a picture and sets the product in a story. 2. Write about your client, not about you. 3. Write in your client’s words. 4. Your client wants to know about the benefits, not features. Some industries may seem more complex than others, and hence you might feel that that’s where you need to come full front and heavy on describing the features. But, really…you don’t. Remember what Steve Jobs said when he introduced the iPod? He didn’t drown us in technical details. Instead, he told us that we’ll have enough space on it to listen music for a trip to the moon and back. In other words, you need to sell the good night's sleep, not the mattress. Some brands are afraid of not being taken seriously if they don’t use “traditional industry” terms or go another way. Yet, if done correctly, this is a great way to stand out in a sea of sameness. Take Cards Against Humanity for example. 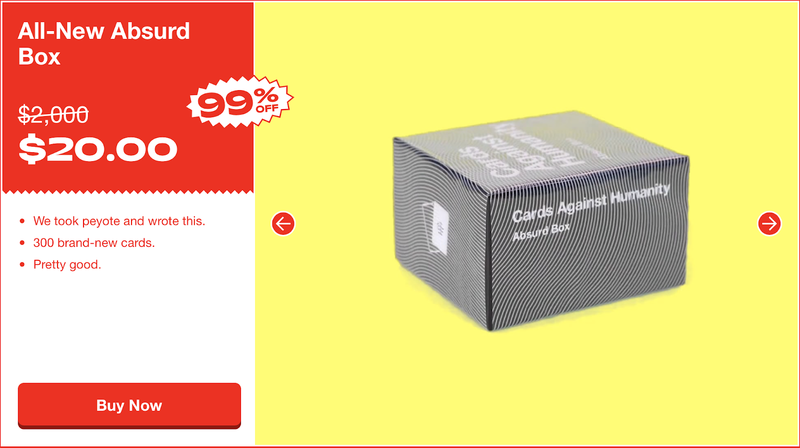 Their “'99% Off' Black Friday Sale” is everything from funny, real to insane. Funny? You bet! Did they go against the current? Absolutely. While everyone was offering crazy deals, they kept the same exact prices they had through the year, and still managed to make a sweet sale. Understanding great copywriting goes so much further than just the copy on your website, About page, or product description. When you want to attract top talent, a job description that uses great copy has higher chances to make a top performer to apply for it. Your Bio that appears for a panel or conference, an investor pitch presentation that captures with great storytelling and powerful persuasion public speaking skills. But, about this, we’ll get back in another post. Even your Tinder profile or the car that you want to sell or house to rent, will get you great results when using great copywriting. When a reader feels understood, they will trust you more. A simple as that sounds, that’s the secret.